Telangana State Southern Power Distribution Company Limited invites applications for the posts of Assistant Engineer (Electrical & Civil) of 153 vacancies on its official websitewww.tssouthernpower.com. 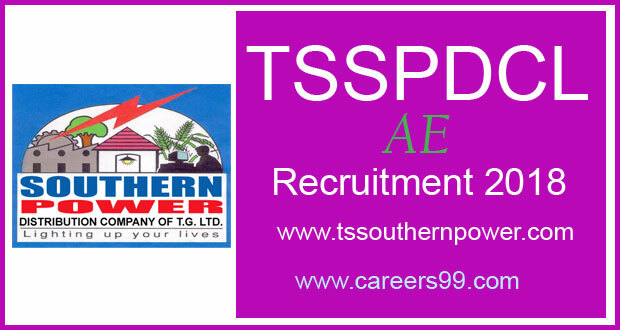 The details of TSSPDCL Notification 2018 are available at www.careers99.com also. Interested and eligible candidates can Apply Online before last date of the Notification i.e., 19.02.2018 . Education qualifications, age limit, selection process and other details are as follows.. Interested candidates those want to apply for TSSPDCL Assistant Engineer (Electrical & Civil) posts must having following educational qualifications. Minimum 18 years and maximum 44 years. The age is reckoned as on 01.01.2018 . The Upper age limit is raised up to 10 years i.e., from 34 to 44 years as per the G.O.Ms.No.190, GA (Ser.A) Dept.Dt:08.08.2017 as adopted vide SP.O.O.Ms.No.767, Dt.01.12.2017 by TSSPDCL. The Upper age limit of 44 years is relaxable up to 5 years in respect of SC/ST/BC candidates and up to 10 years in respect of Physically Handicapped candidates.